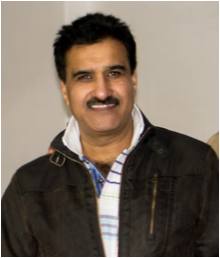 I was born in Ambala , India on 27 April 1958 and moved to the UK in 2002. I am currently living in Birmingham, England. Having got my Bachelor of Arts from Kurukshetra University, India I moved to Delhi University in 1978 for studying literature and later on did my M.Phil in English literature followed by a Degree in Law. Having been awarded commendation for painting in Kurukshetra University Youth Festival in 1977 I pursued painting on amateur level for sometime. The prime focus of my contemplation and work has been Indian Mythology. The study and contemplation of the magic and mystique of lofty mythological characters has been a sublime experience strengthening my belief and inspiring me ever so more to revere the divinity in the subjects that I studied. It is this sublime and divine that prompts me to take to canvas. Painting for me is an expression of the underlying belief in the mystique of mythology drawing inspiration not from any scholastic or artistic pretensions but faith.